The one and only AMY SCHUMER performs at Constellation on August 20! featuring Mike Reed & Nick Butcher, kicks things off. 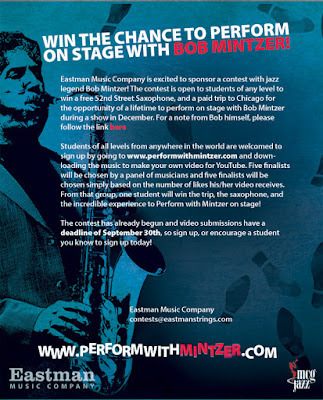 at Constellation, 3111 N. Western Ave.
Want to Perform On-Stage with Bob Mintzer? 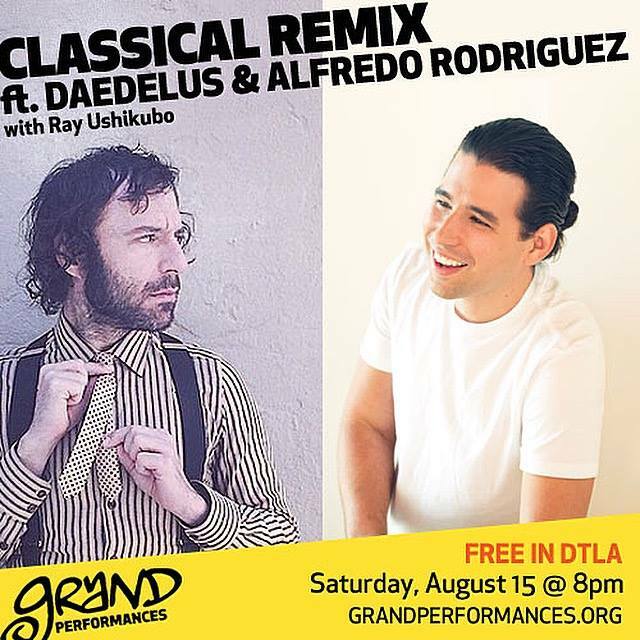 Don't miss this special evening of "Classical Remix" by Daedelus & the Cuban virtuoso pianist Alfredo Rodriguez -- with Eay Ushikubo -- @ Grand Performances in Downtown LA. Free entrance! This next Saturday, August 15, 8pm. 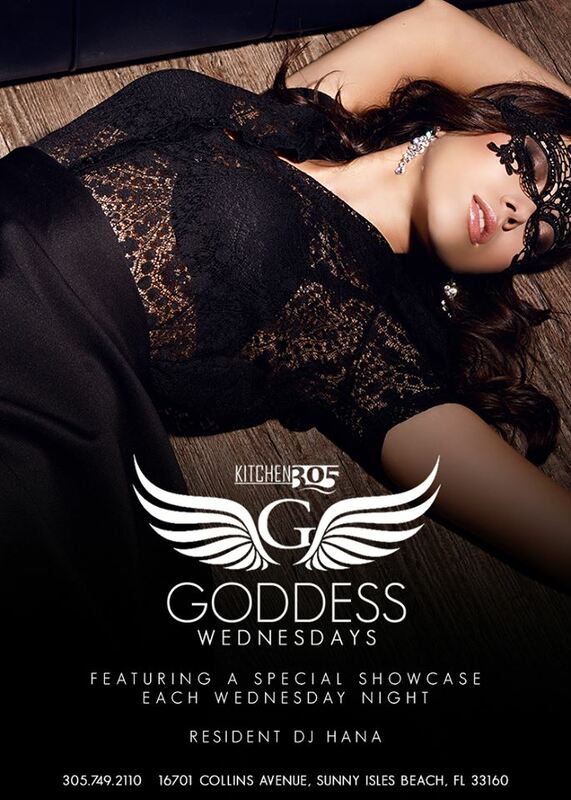 See u there! 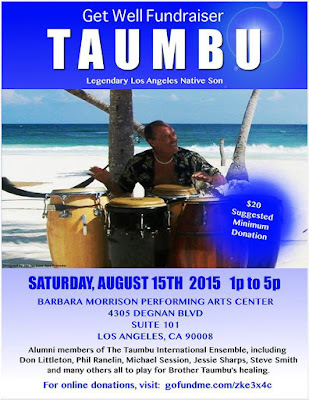 This next Saturday, August 15 @ Barbara Morrison Performing Arts Center (4305 Degan Blvd. Suite 101, Los Angeles, CA), don't miss a Fundraiser Concert for the legendary Los Angeles native son, percussionist Tambu. 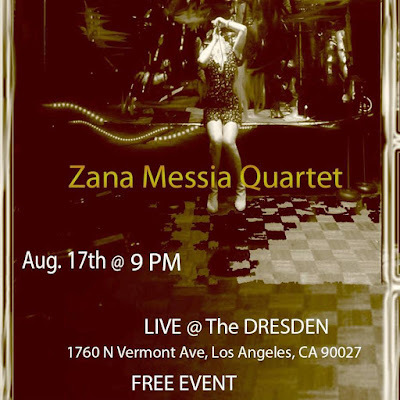 Free concert by the Zana Messia Quartet in LA! 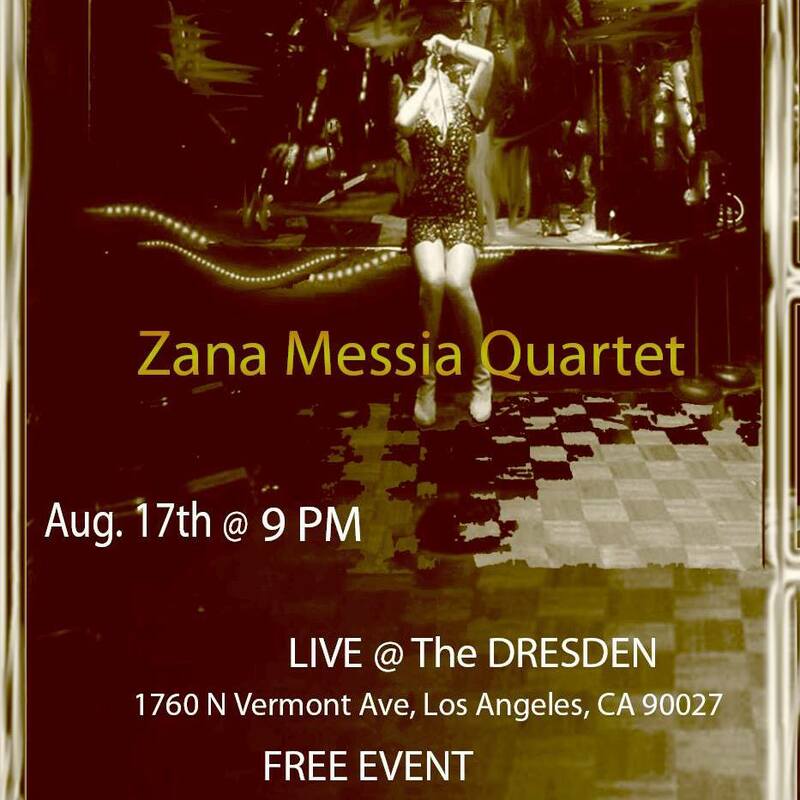 The gorgeous LA-based singer Zana Messia leads her quartet @ The Dresden (1760 North Vermont Avenue) here in Los Angeles on August 17, at 9pm. With Dimitris Jimmy Mahlis (oud & guitar), Sezani Ahmet Turmenoglu (bass) & Chris Wabich (drums). 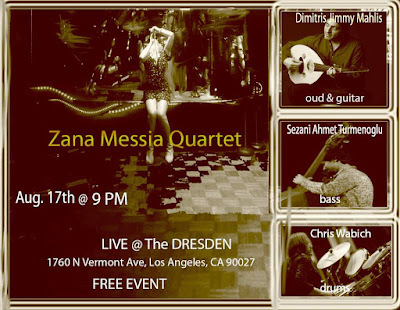 Zana has recorded for Universal Music, studied Ethnomusicology at UCLA, wrote awarded songs for "The Lightkeepers" and other movies, was heard by legendary producers Quincy Jones and Jerry Moss, collaborated with Harvey Mason (who was the executive producer of her American debut album, "Zana Messia & The Balkan Soul Orchestra" along with her husband, David Marcus), recorded an accalaimed version of Carlinhos Brown's "Maria Caipirinha (Samba da Bahia") for the 2014 FIFA World Cup, and also leads her own jazz group. 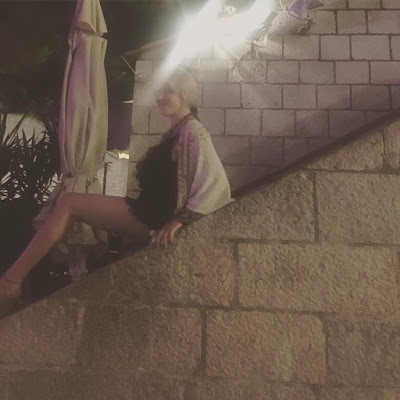 It's a free event and I'm sure you'll be mesmerized by this great vocalist (born Zana Mesihovic in Mostar, in the former Yusgoslavia, now Federation of Bosnia and Herzegovina) who also happens to be a wonderful human being and one of the most beautiful women on Earth, a true Goddess from the Balkans. Vinyl Reissue of the Month - "Deodato: Love Island"
Beyond CD of the Month - "Hubert Laws, Steve Barta & Jeffrey Biegel"
This brand-new outstanding Symphonic Arrangement, by Steve Barta, adds a new dimension to the work and updates its marvelous content, highlighted by jazz supreme flutist Hubert Laws and virtuoso pianist Jeffrey Biegel. Barta did a brilliant job, achieving perfect balance between respect for the original suite and the creative impetus that led him to create a vivid orchestral score, full of energy and sophistication, perfecting all nuances and subtleties. Mike Valerio (bassist) and Michael Shapiro (drummer who was a member of Flora Purim/Airto Moreira's group for many years) also shine throughout the album. Soon available also on vinyl, it's already one of the best releases of the year! 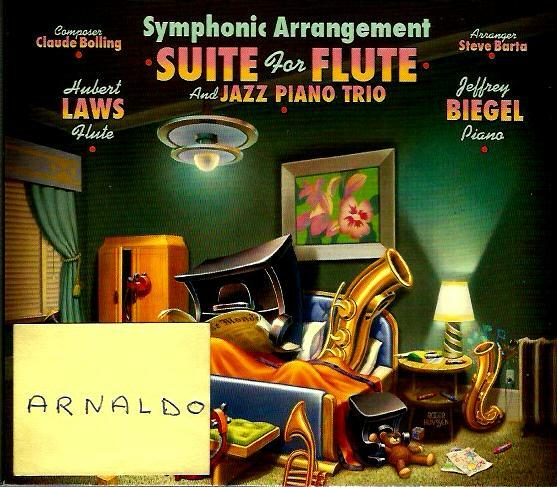 Jeffrey Biegel: "In the 1970s, I was one of millions of fans of Claude Bolling's "Suite for Flute and Jazz Piano". 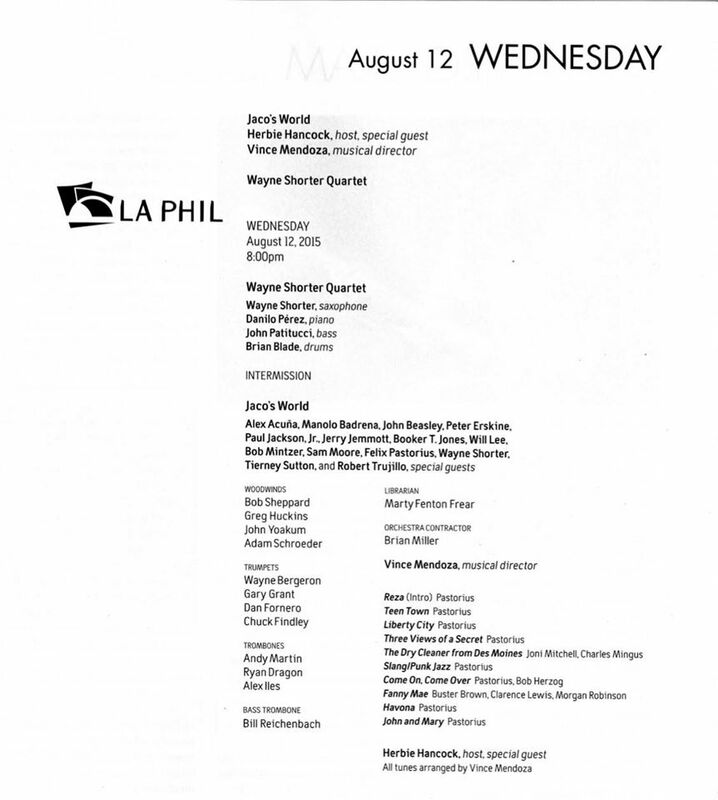 Fast forward to 2008, I met with Steve Barta during an engagement with the Colorado Springs Philharmonic. We talked about music and various styles. I shared with Steve how much I loved the Bolling Suite, and that I thought it might be cool with orchestra. He said he always felt the same about it. 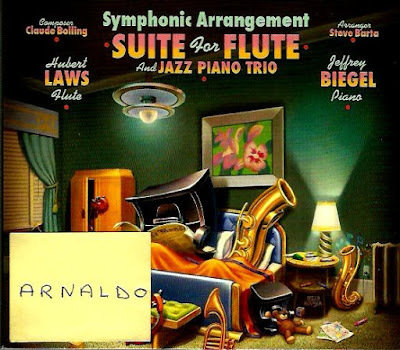 Here we are--seven years later--with this new recording, arranged by Steve, featuring the amazing jazz flutist, Hubert Laws and fabulous co-musicians in the new 'Symphonic Arrangement' of the "Suite for Flute and Jazz Piano". Special thanks to Roger Huyssen, Inc. for becoming a close frined with Steve and bringing his legendary artwork to this new recording! Special thanks also go to Manuelle Pefferkorn Mazerand for her work with Claude and helping us bring this recording to the public." The World Premiere of Steve Barta's "Symphonic Arrangement: Suite for Flute and JazzPiano" is with the South Shore Symphony Orchestra will happen on November 20 and 21, conducted by Scott Jackson Wiley as they bring legendary jazz flutist Hubert Laws to Long Island for the premiere live performance. Please mark your calendars! Vocal CD of the Month - "Ellen Johnson: Form & Formless"
Instrumental Jazz CD of the Month - "Isaac Darche: Team & Variations"
In the nearly ten years that guitarist Isaac Darche has called New York home, the San Francisco Bay Area native has found opportunities to work with many rising jazz stars and to pursue his own muse. 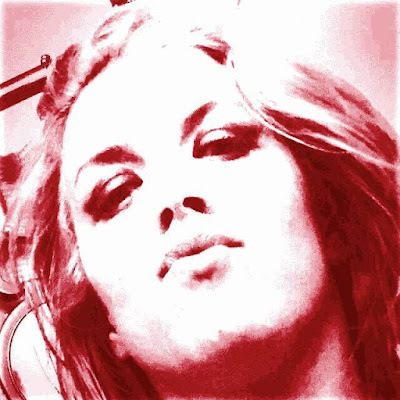 He's emerged as a rising star himself and is now following up on the 2012 release of his well-received debut Boom-Baptism withTeam & Variations, to be released by the Dutch-based Challenge Records label on April 14. Darche's fluid, warm-toned style reflects the classic influence of Wes Montgomery and Pat Martino. But as indicated by the title of the album's opening track, "A 'Winkel in Time" -- a nod to influential guitarist Kurt Rosenwinkel -- he is open to the innovations of all kinds of stylists. "Pushing the boundaries musically yet keeping a certain authentic 'jazz feeling' was very important to me on this project," says the leader. 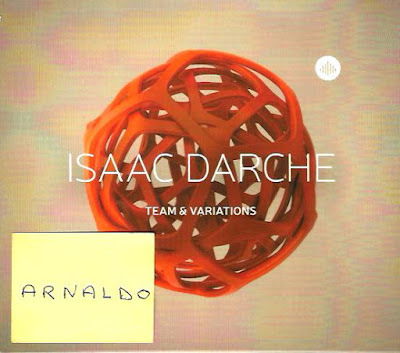 Darche's performances on the new CD with ace team members Chad Lefkowitz-Brown on tenor saxophone, pianist Glenn Zaleski, bassist Desmond White, and standout drummer E.J. Strickland confirm his status as one of the most impressive young guitarists on the scene. The playful titles of the originals are drawn from his life. "Sloped Perspective," a wry reference to Brooklyn's Park Slope community, where many jazz musicians live, strives for a combination of simplicity and complexity. "Arts of a Bachelor," an experiment in unusual intervals, reflects on his schooling. "Don't Run out of Money," a double time-exercise with a melody that evolved out of guitar voicings, is the ultimate advice for living in New York. 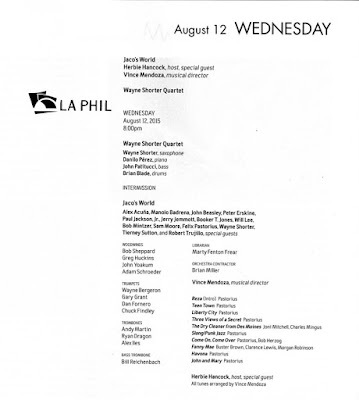 Fresh readings of the standards "You Stepped Out of a Dream" and "Nobody Else But Me" are also in the mix, along with his take on Wayne Shorter's "Ana Maria." Born and raised in San Anselmo, California, just north of San Francisco, Isaac Darche, 32, started playing the clarinet at age 7, switched to the guitar at 10, and was also playing the saxophone a year or so later. It was the sound of the guitar -- specifically the pure, beautiful jazz sound of the Gibson L-5 models as played by Montgomery and Martino -- that hooked him. 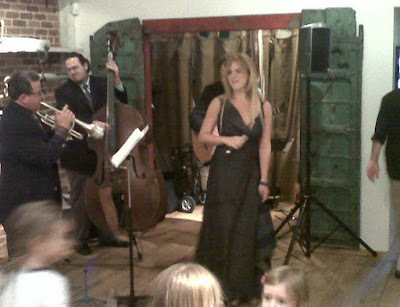 He played in various groups at Marin Academy, a San Rafael high school known for its strong arts program. While attending the Stanford Jazz Workshop Jazz Camp as a young teenager, Darche was blown away by a performance featuring fellow students Ambrose Akinmusire, Jonathan Finlayson, Dayna Stephens, and Taylor Eigsti. "I kept thinking, oh my God, I'm so far behind, this is crazy," he recalls. 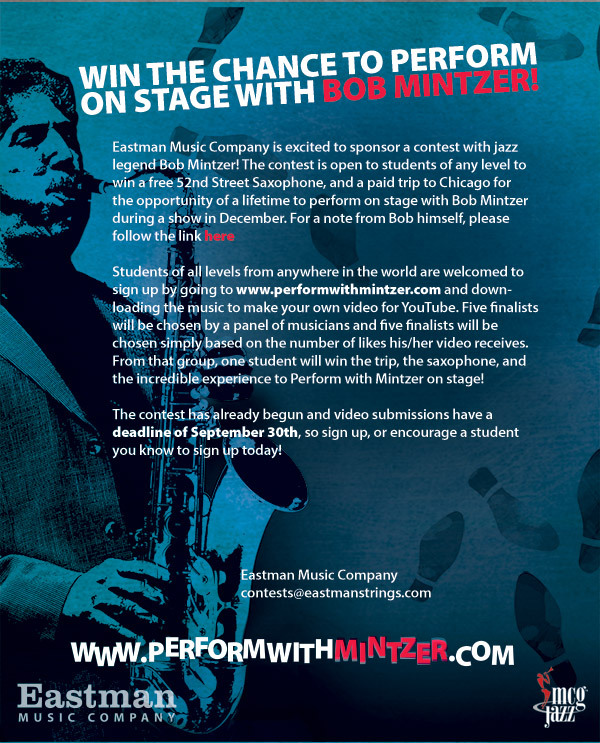 He went on to attend UCLA, studying with Billy Higgins, Anthony Wilson, and, primarily, the distinguished guitarist and composer Kenny Burrell, whose groundbreaking course on Duke Ellington was an essential part of the curriculum. Burrell was a stickler for good tone, good phrasing, and swing feel. "He would stop us and say, 'This is not swinging,'" said Darche. "But he was open to all kinds of music." Darche was encouraged to go to New York by guitarist and "super sideman"Randy Napoleon. His "boom-baptism" there was eased by all the great music happening around him. 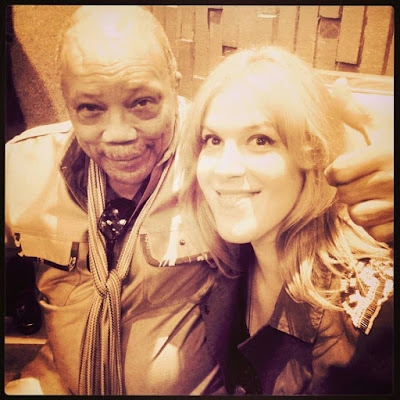 He got hired by keyboardist Sean Wayland, and played with numerous other artists includingMark Shim, Jon Gordon, Randy Ingram, Henry Cole, Linda Oh, and his old campmateAmbrose Akinmusire. 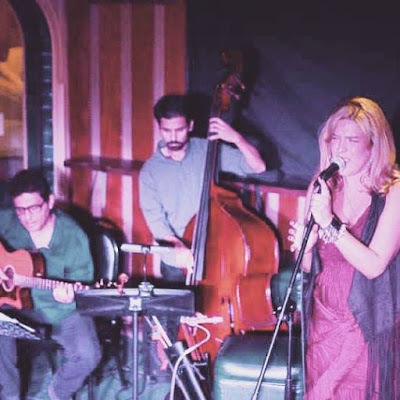 "It's no easy accomplishment in a field packed with guitarists," wrote David Adler in NYC Jazz Record of Boom-Baptism, "but Darche has found a unique sound and technical approach on the instrument. His tone is bright, his articulation blindingly fast and flawless, his rhythm consistently in the pocket but full of breath, never stiff. 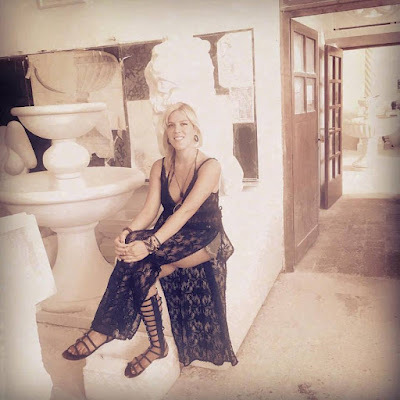 ... Effortlessly forward thinking, free of idiomatic clichés."